Changes to the welfare system: implications for people with a learning disability Tatu Delaney Regional Campaigns Officer September 2012. 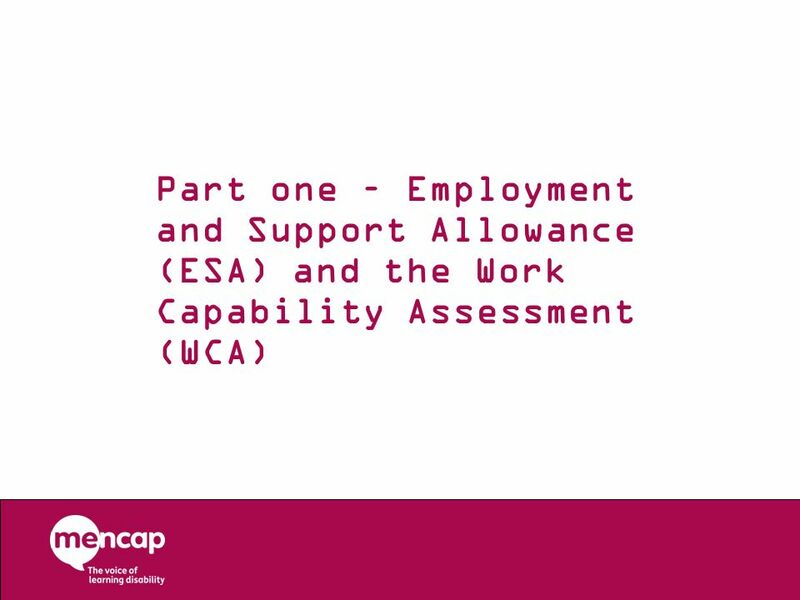 2 Overview Employment and Support Allowance (ESA) & the Work Capability Assessment (WCA) DLA reform – the new Personal Independence Payment (PIP) Wider changes under the Welfare Reform Act 2012: Housing Benefit changes A new Universal Credit This presentation will cover: 1. The employment and support allowance 2. Reform of DLA 3. And then a little on the new Universal Credit and some changes to Housing Benefit which came out of the recent Welfare Reform Act 2012. 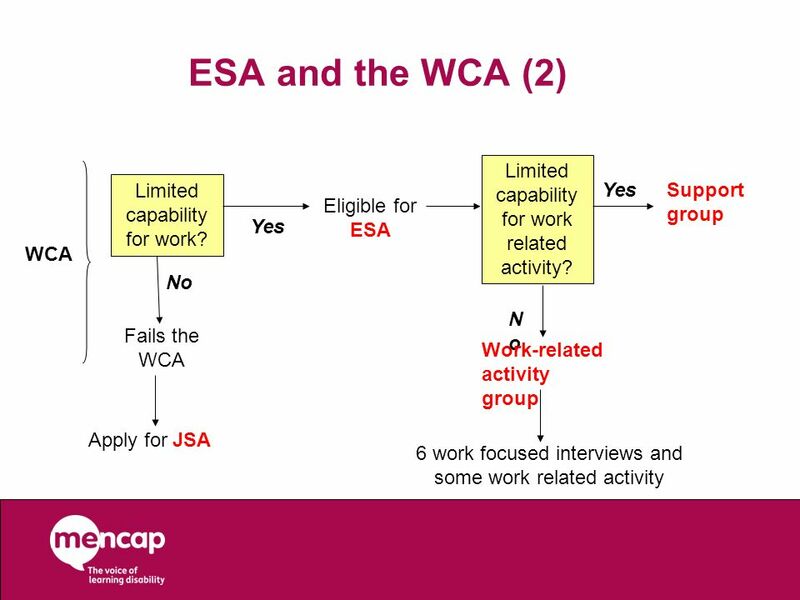 5 ESA and the WCA (2) Limited capability for work related activity? Near review date – letter from JCP Telephone call from JCP ESA 50 form WCA (for the majority) – claimants can take a supporter, they can request help with taxi fares, in some cases they may be able to be examined at home A decision maker will telephone to inform claimant of decision they are likely to make This is just an overview of the process for existing claimants (i.e. those claimants on Incapacity Benefit, Income Support and Severe Disability Allowance). This is what will happen to inform them that they will be being reassessed for ESA. 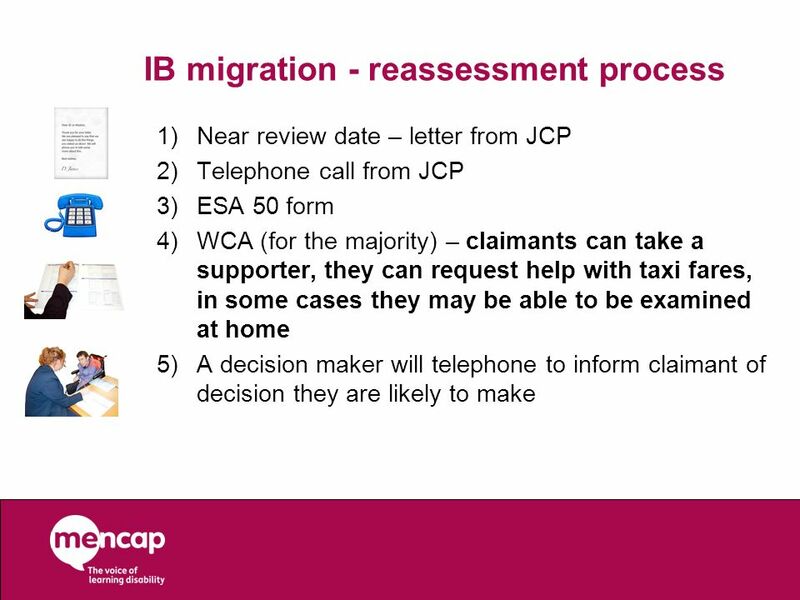 REFER TO HAND OUT ON IB MIGRATION FOR MORE DETAILS OF TIMINGS AND PROCESS – includes details about taking someone as a supporter to the assessment etc. 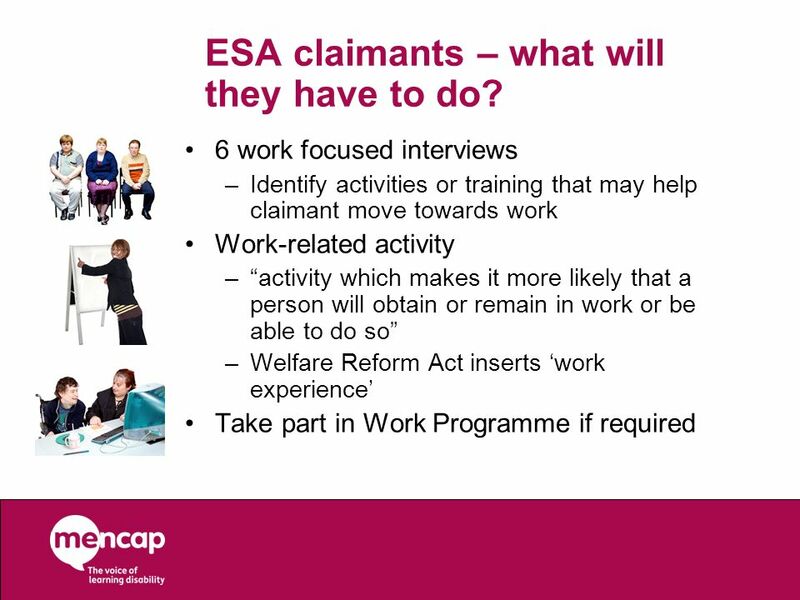 7 ESA claimants – what will they have to do? 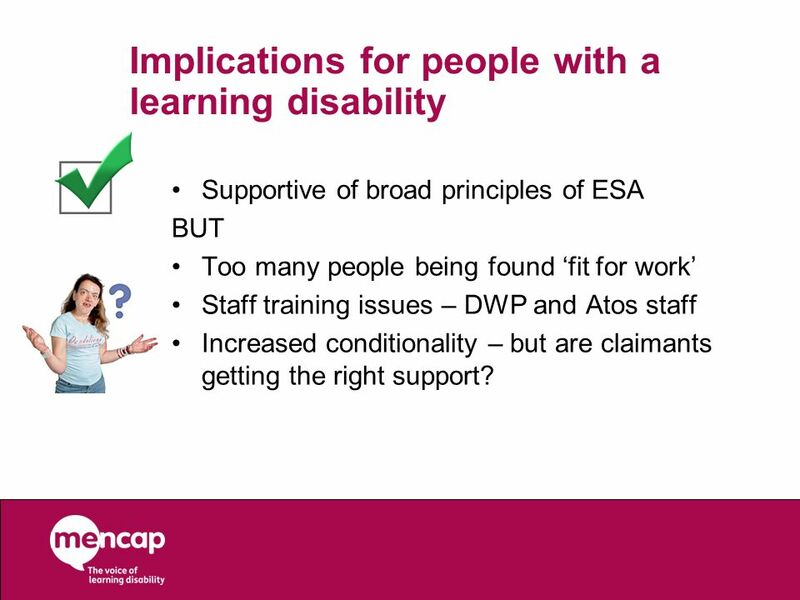 Supportive of broad principles of ESA BUT Too many people being found ‘fit for work’ Staff training issues – DWP and Atos staff Increased conditionality – but are claimants getting the right support? . When ESA was introduced Mencap welcomed the recognition in ESA that there will be some people who face additional barriers to employment and may need extra support to get there. So, the idea of having a Work Related Activity Group seemed a good one in principle. HOWEVER: - The disability sector are worried about the high numbers of people failing the WCA and being found ‘fit fork work’. The figure for new claimants being found fit for work is about 60%, with 26% being found eligible for the WRAG group of ESA. 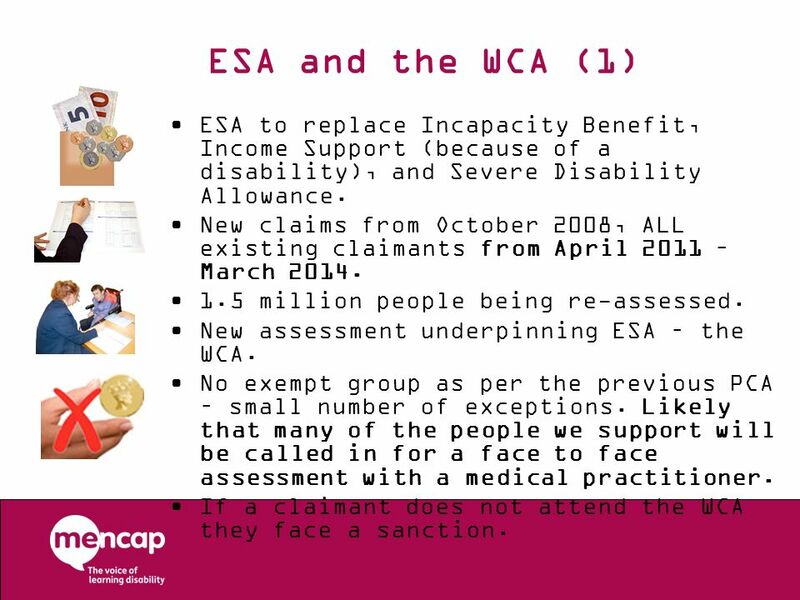 When ESA was being introduced the Government suggested 46% for those in WRAG. - We do not think the WCA is working well for people with a learning disability, with the thresholds for eligibility being too high. We also think that the process concentrates too much on the face to face assessment, when other evidence should be being taken into account by a DWP decision maker when an ESA decision is made. - We also know that there are issues with Atos, where assessors don’t have expertise in the conditions / disabilities they are assessing. Further, we want to make sure conditions places on claimants are reasonable, therefore essential that DWP staff understand the support needs of pwld too. Finally, are people getting the appropriate and expert employment support? What are people with a ld’s experiences of the Work Programme? 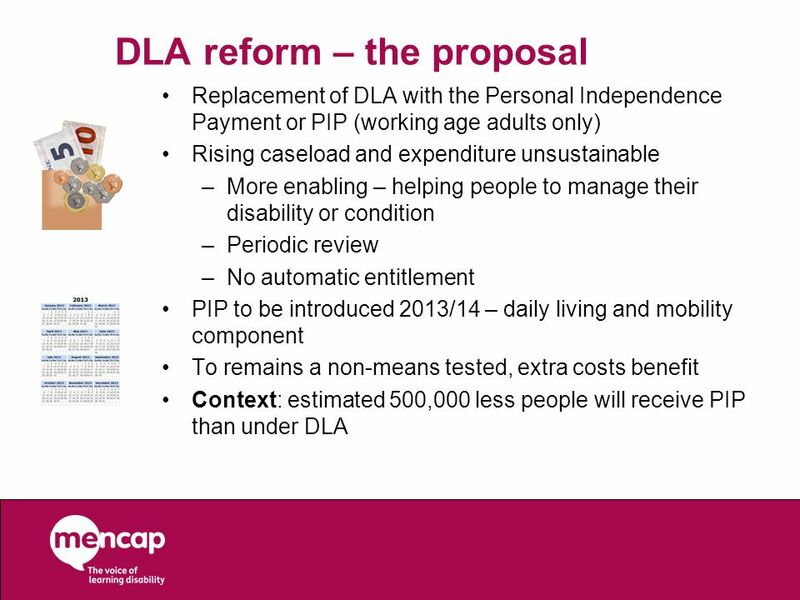 Replacement of DLA with the Personal Independence Payment or PIP (working age adults only) Rising caseload and expenditure unsustainable More enabling – helping people to manage their disability or condition Periodic review No automatic entitlement PIP to be introduced 2013/14 – daily living and mobility component To remains a non-means tested, extra costs benefit Context: estimated 500,000 less people will receive PIP than under DLA Many of you will have heard of Disability Living Allowance. This is a benefit aimed at helping disabled people meet the extra costs that they face because of their disability. 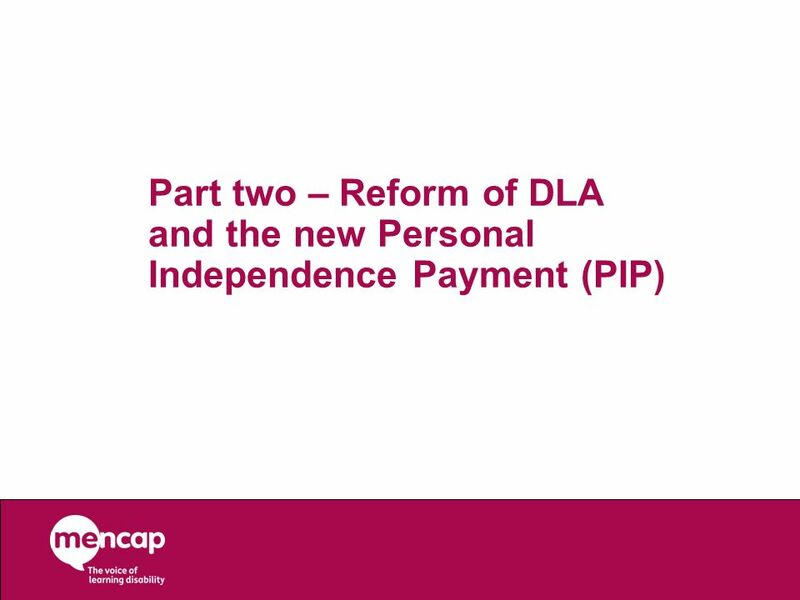 The Government are replacing DLA with the Personal Independence Payment. They have said that the expenditure for DLA is unsustainable and that it is not the best way of measuring disability related costs. 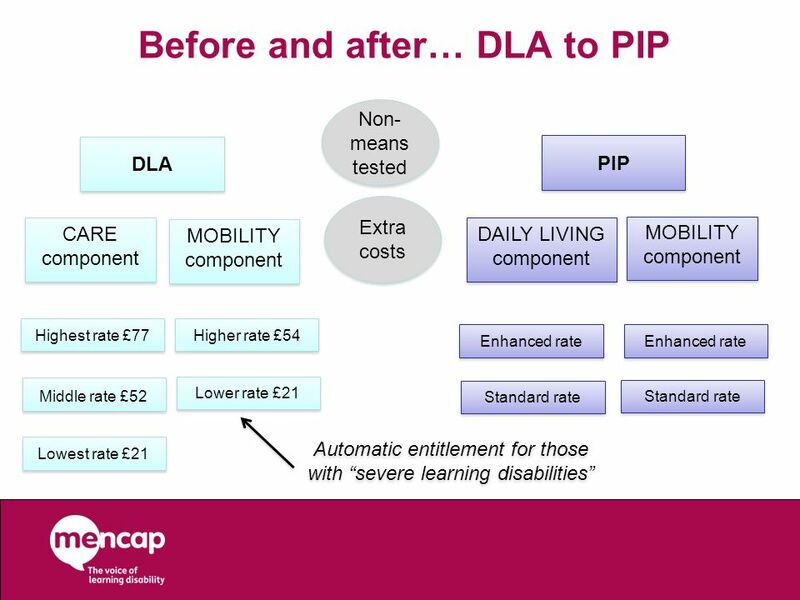 PIP will be different to DLA in a number of ways. While it will remain an ‘extra costs’ benefit, instead of having a care component and a mobility component, it will have a daily living and mobility component. The Government is getting rid of life time awards and introducing periodic reviews. They are also getting rid of the automatic entitlements that exist for DLA. E.g. 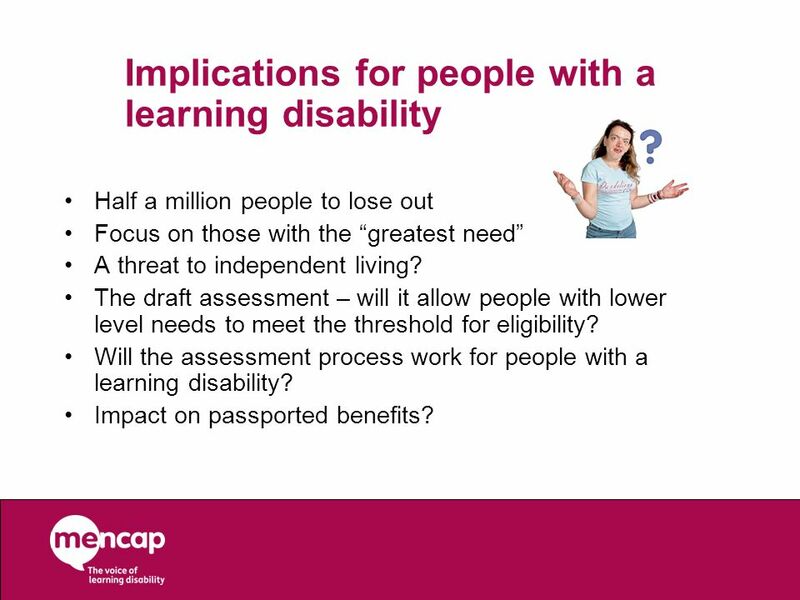 people with severe learning disabilities have an automatic entitlement for DLA without having to go through the assessment process. The Government have estimated that 500,000 less people will receive PIP than under DLA. 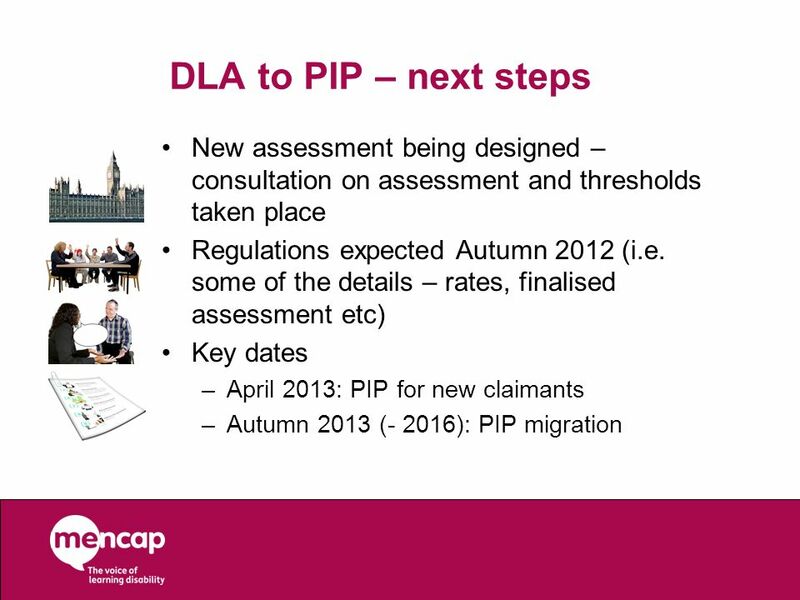 12 DLA to PIP – next steps New assessment being designed – consultation on assessment and thresholds taken place Regulations expected Autumn 2012 (i.e. some of the details – rates, finalised assessment etc) Key dates April 2013: PIP for new claimants Autumn 2013 (- 2016): PIP migration There has been a few PIP consultations, the main one being around what the new assessment will look like. 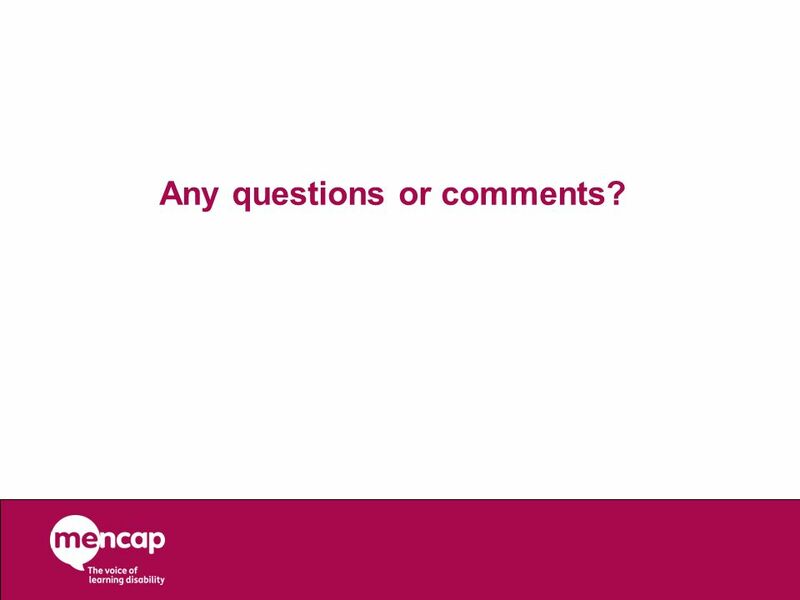 Mencap has been inputting to try and ensure that pwld are taken into account. The details are due to be published in the Autumn in regulations. The Government are aiming to introduce PIP for new claimants in April 2013, with the migration process (i.e. the moving of existing DLA claimants across to PUP starting in the Autumn of 2013 and going on until 2016. 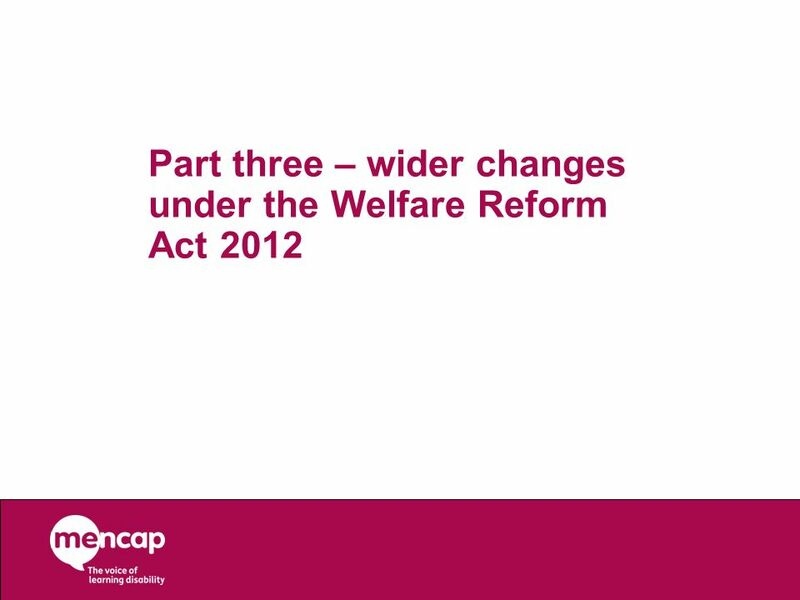 The recent welfare reform act also introduced a number of other important changes. I’m now going to briefly cover some changes to housing benefit and the new Universal Credit. 450,000 disabled people affected Some exceptions for those with a social care package including overnight carer Household benefit cap Upper limit, family: £26k (£500 / week) Upper limit, single person £19k (£350 / week) Exemptions – DLA recipient Council Tax Benefit Outside the Universal Credit Council discretion, but with Government requirement to achieve 10% cut whilst maintaining concessions for older people New size criteria This is for Housing Benefit claimants in the social rented sector (e.g. council housing or housing association property). It’s also known as ‘under-occupancy’ or ‘Bedroom Tax’. This restricts housing benefit amounts to allow for one bedroom for each person or couple living as part of the household. In effect, this will, in many cases, reduce the number of bedrooms that an individual is entitled to. As a result, tenants will either receive a reduced amount of Housing Benefit - and have to make up any shortfall between this and their rent – or be forced to move home. While there is one exception to the new size criteria for disabled people, this applies only to disabled tenants who need non-resident overnight carers (i.e. where this is paid for as part of their social care package). In particular, Mencap is concerned about those people with a learning disability who are reliant on their spare room to support informal care arrangements or who may be reliant on support networks within the area in which they live to provide support. Household Benefit Cap From April 2013 there will be a cap on the total amount of benefit that people of working age can receive. If someone’s total benefits assessment is greater than their cap their local authority will reduce their housing benefit payments. Households will be exempt from the cap where: someone is claiming the ESA support component or receiving DLA. 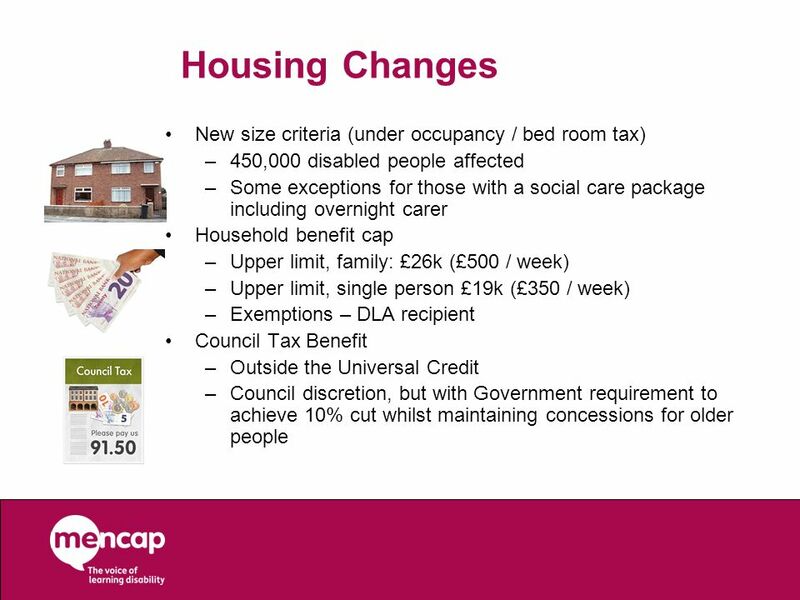 Mencap is concerned that adults with a learning disability who are not in the ESA support group and ineligible for PIP could become subject to a benefit cap reduction, struggle to meet rent liabilities and possibly be at risk of homelessness. CTB Councils will see a 10% cut in funding, but have been told to retain the criteria and allowances currently in place - in particular, pensioner council tax support. Mencap is concerned that this 10% reduction in funding will impact working-age claimants, with authorities having discretion over how savings are to be realised. To replace all means-tested support (i.e. Income Support, income-based Jobseeker’s Allowance, income-related Employment and Support Allowance, Housing Benefit, Child Tax Credit and Working Tax Credit). Aim: improve work incentives (i.e. people are often not better off in work) and to make the system less complicated. Basic allowance + additional elements for disability, children, housing costs etc. First individuals expected to enter the new system from 2013. Great in principle, but some issues with the details: Loss of Severe Disability Premium Children’s disability additions Finally, perhaps most radical part of the Welfare ReformAct has been to legislate to introduce a new Universal Credit. The Act provides for the introduction of a Universal Credit to replace most of the benefits and tax credits that currently provide means-tested support (i.e. Income Support, income-based Jobseeker’s Allowance, income-related Employment and Support Allowance, Housing Benefit, Child Tax Credit and Working Tax Credit). 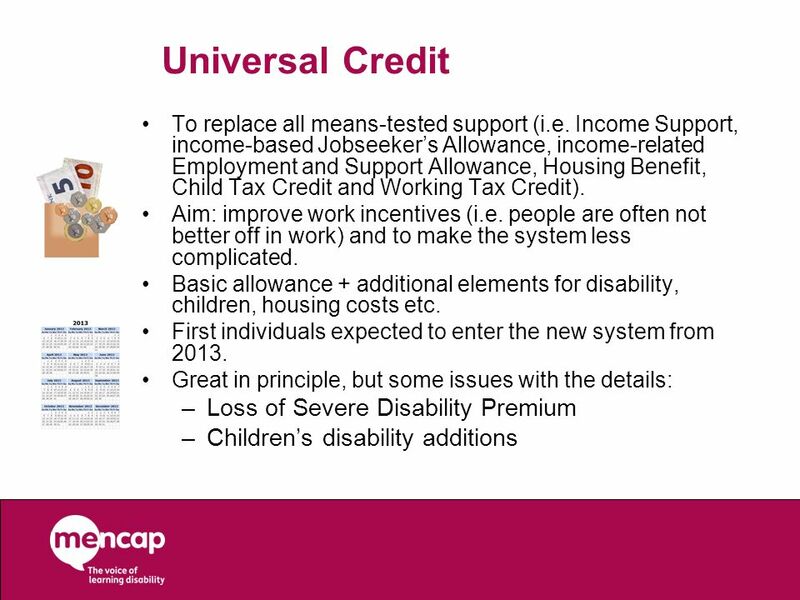 Mencap welcomes the stated principles behind the Universal Credit: simplify the benefits system and making work pay. However, we are concerned about the potential loss of income for disabled people through the merger in Universal Credit of Tax Credits and disability premiums. Thus, things like the Severe Disability Premium will no longer exist within the Universal Credit. There are other ways that disabled people will get extra support but there are some instances where we believe people will face a reduced income. It is important to note with all of these changes that there are transitional protections, so that existing benefit claimants won’t see a massive ‘drop-off’ in their financial support. 17 Any questions or comments? 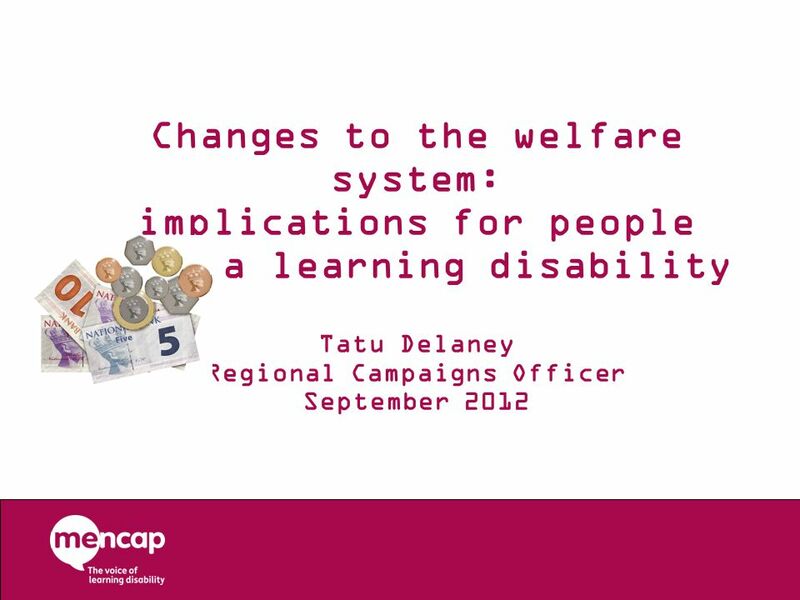 Download ppt "Changes to the welfare system: implications for people with a learning disability Tatu Delaney Regional Campaigns Officer September 2012." Welfare Rights Training 2009 Carers Allowance Taxable: Yes Means Tested: No (Only earnings stops it) An allowance paid to someone over 16 who spends. Changes to benefits: what do they really mean for people with a learning disability and their families? April 2013. Universal Credit & Welfare Reform Implications for The Princes Trust and the young people we work with. FINANICAL INCLUSION & WELFARE REFORM Presentation by Sharon MacPherson & Robert Hinds. Poverty & Disabled People: The Deepening Divide. Scale of the problem? In 2012/13, 20% of individuals in families containing a disabled adult were living. Welfare Reform From Poverty to Financial Inclusion 17 th October 2012. 1 Landlords Forum 15 th September 2011 LHA changes and Universal Credit Mick Bullock. Welfare Reform Changes to Benefits BT Benevolent Fund – June 2013. Wincred Welfare Reforms & Financial Inclusion. Background Welfare Reform Act 2012 gained Royal Assent 8 th March 2012 Government purpose is to –Reduce. Welfare Reform Ray Perry Kent County Council. Introduction The next few years will see profound changes to the welfare system in the UK The changes proposed. Welfare Reform Jude Bevan Revenues & Benefit Service Manager. Welfare Reform 14 October 2013. Welfare Reform The Impact on People With Brain Injury Kathleen McMonagle Client Support Manager. 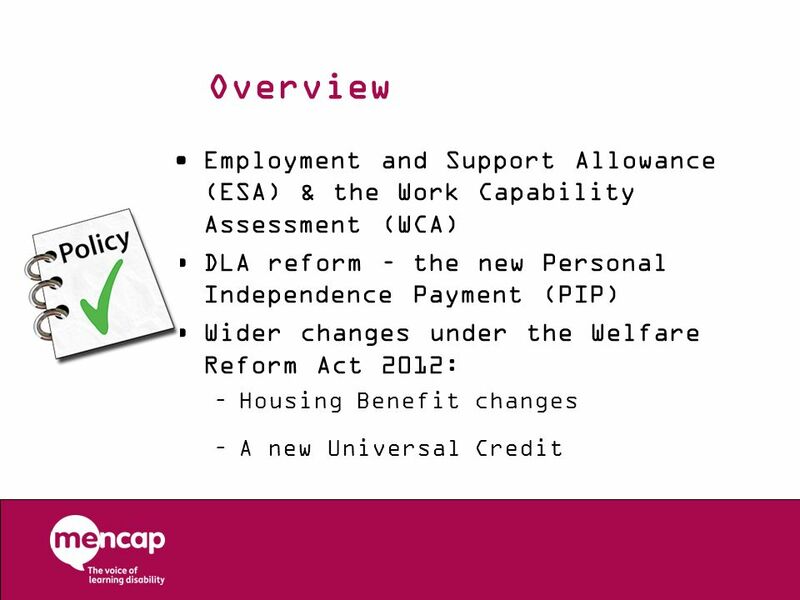 Welfare Reforms An overview of the benefits affected and potential impact. Over £100 million distributed to people in need Benefits Overview Welfare State Benefits 2013.